Anthony Ausgang was born in Trinidad and Tobago in 1959 to a Dutch mother and Welsh father. The family moved to Houston Texas in the early 1960s, a particularly difficult time for an immigrant family to parse American culture. Nevertheless, Ausgang’s father made brave attempts to assimilate by attending custom car shows and demolition derbies. Ausgang eventually encountered Ed Roth and before long had a shoebox full of Rat Finks, a small plastic figurine of a noxious rodent that had somehow become the embodiment of Hot Rod and Custom Car Culture. Ausgang’s mother continued the European traditions by dragging her son to endless operas, symphonies and art museums. This combination of High Art and Low Art was to prove a fertile cultural mulch for Ausgang’s artistic inclinations. After a short stint studying art at The University Of Texas in Austin, Ausgang succumbed to the myth of California and moved to Los Angeles where he began classes at The Otis Art Institute. Disappointed to find out that the curriculum there didn’t include target practice, admiring cars or watching surf films, Ausgang dropped out to start showing his artwork to as many galleries as would tolerate his frequent visits. Finally accepted by the infamous Zero One Gallery, a combination of after hours nightclub, gallery and crashpad, he had his first official sale, to a drug dealer. At his solo show later that year Ausgang sold to a more diverse and socially acceptable crew as collectors and critics began to take notice. At the Zero One Ausgang met Robert Williams, who had been one of the main forces at Roth Studios in the 1960’s and at this time was the most successful practitioner of the type of art that would later be called Low Brow. 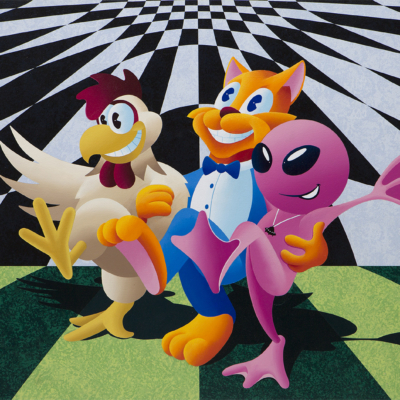 As the « official » artworld began to accept Ausgang’s work so did the commercial artworld and he began making record covers and posters and working as a consultant on computer generated animation. In 1993 Ausgang was included in the Laguna Beach Art Museum’s seminal exhibit « Kustom Kulture » which investigated art influenced by gearhead car culture. In 2003 Ausgang’s paintings could be seen in Morning Wood, a primer of Post Graf art; in 2004 his work graced the pages of contemporary art survey Pop Surrealism and in 2005 Weirdo Deluxe explained his art to the unenlightened. Ausgang draws influence from as many outside channels as possible, preferring the toy contents of grocery store gumball machines over the latest exhibit at the Whitney. Opinionated but informed, he is able to see the beauty in both a Rembrandt and a rat rod. 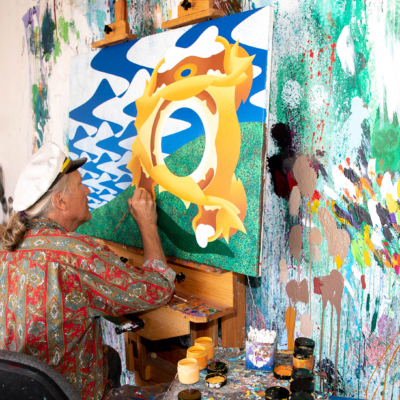 This variety of interest has led him to design his artwork on the computer but complete it on the easel, the perfect combination of new technology and traditional media.